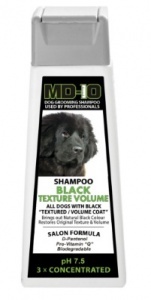 MD10 Black Texture Shampoo - Professional grade dog shampoo. For all dogs with thick or textured coats. It restores original shape / curl from the roots and gives volume. Ideal for dogs with solid black coats to improve their colour and shine. The shampoo will not discolour white or coloured patches on your dog's coat but if your dog has more white than black in their coat we suggest using White Texture Volume Shampoo. Suitable for: Newfoundland; Giant Poodle; Briards; Black German Shepherd; Bouvier des Flandres; Spanish Water Dog; Portughese Water Dog and many more.